Accidents will happen and some of the louvers on your beautiful plantation shutters may get broken. 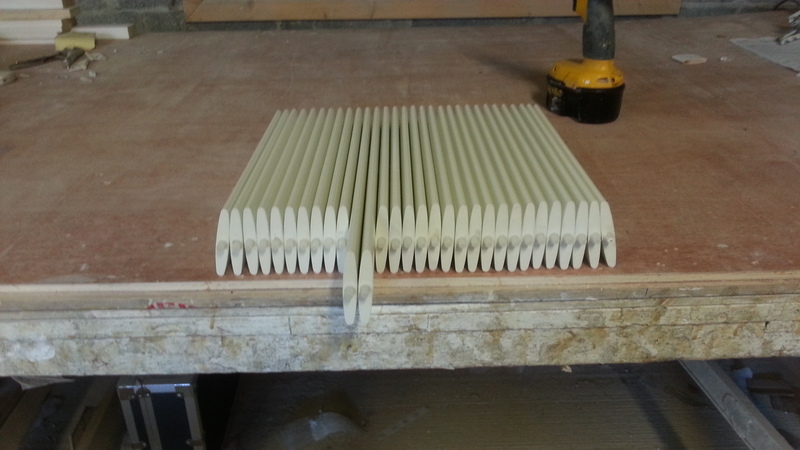 Well don’t despair as we have replacement louvers available, cut to the exact length you need, drilled on both ends for the louver pins and stapled in the front if you have a tilt rod for opening and closing the louvers or drilled for a hidden tilt rod if that’s what you have. These can be bought in our online store in 64mm and 89mm elliptical and in pure white and silk white. Here’s a picture of a batch we sent off to a customer in London last week. If you have any queries or need any help, don’t hesitate to contact me. Our new online store is under construction, but if you need replacement parts for your shutters, you can buy them now online, while the work is continuing. We stock replacement louvre pins and shutter staples which seem to deal with the majority of problems our customers encounter with their shutters. You’ll also find nylon louvre pins, louvre tension parts as well as Velux shutters and temporary blinds. We’re also very excited to be launching our ShutterPro range of plantation shutter components for those of you who want to build your own shutters. Contact us if you have any queries on shutters whatsoever. We’ll be glad to help! Accidents will happen around the home. Things end up getting broken and plantation window shutters are no different. Don’t worry if something goes wrong with your shutters. We have all the replacement shutter parts in stock to put things right. So what’s likely to go wrong? The most common requests we get for shutter parts from our customers are for louvre staples and louvre pins. Staples are inserted into the louvres and tilt rod and this connection allows you to open and close the louvres by pushing the tilt rod. Through wear and tear or someone actually pulling them out, these staples may, every so often need replacing. It’s a very simple job that takes no more than 5 minutes using a needle nose pliers and some super glue gel. We have an instruction leaflet showing you what to do. The second most likely problem home owners encounter with their shutters is broken louvres or a broken louvre pin. If a louvre gets broken or is damaged, again it’s very easy to replace and we have these in stock. In order to replace the louvre without taking the whole frame apart, you will need what’s called a spring-loaded replacement louvre pin. Quite an easy job to do also and we have full instructions showing you how to do it. If it’s just the louvre pin that’s been broken, simply insert the replacement pin mentioned above, into the hole in the frame where the original pin was, and the spring tip will pop into the hole in the edge of the louvre. So when your shutters are broken, they needn’t remain unsightly for too long. Fantastic I hear you say, but how can I get hold of these spare parts for shutters? We’ll post a notice on here also. Most people agree that plantation shutters look absolutely stunning in any home. But all it takes is one detached louvre and they can very quickly turn into an eyesore. Your first port of call is usually the supplier you got them from. But let me guess; they said they would call you back and you’ve never heard from them since. They just couldn’t be bothered with repairs or spare parts. Well help is at hand! The Shutterplus online store is now open with everything from off-the-shelf velux shutters, to spare shutter parts, fixings and specialist shutter hardware. There’s even temporary blinds while you wait for your shutter order to arrive. And all available for shipping next day! So don’t let that broken shutter annoy you. Visit The Shutterplus Online Store now and with our easy to follow instructions, your plantation shutters will look as good as new in no time.